Abstract: With the challenge of optimizing iron delivery, new intravenous (iv) iron–carbohydrate complexes have been developed in the last few years. A good example of these new compounds is ferric carboxymaltose (FCM), which has recently been approved by the US Food and Drug Administration for the treatment of iron deficiency anemia in adult patients who are intolerant to oral iron or present an unsatisfactory response to oral iron, and in adult patients with non-dialysis-dependent chronic kidney disease (NDD-CKD). 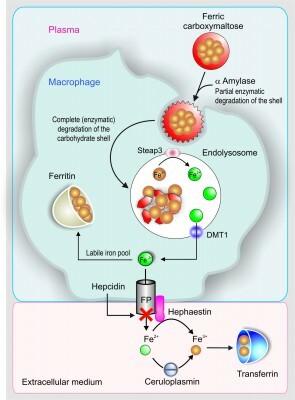 FCM is a robust and stable complex similar to ferritin, which minimizes the release of labile iron during administration, allowing higher doses to be administered in a single application and with a favorable cost-effective rate. Cumulative information from randomized, controlled, multicenter trials on a diverse range of indications, including patients with chronic heart failure, postpartum anemia/abnormal uterine bleeding, inflammatory bowel disease, NDD-CKD, and those undergoing hemodialysis, supports the efficacy of FCM for iron replacement in patients with iron deficiency and iron-deficiency anemia. Furthermore, as FCM is a dextran-free iron–carbohydrate complex (which has a very low risk for hypersensitivity reactions) with a small proportion of the reported adverse effects in a large number of subjects who received FCM, it may be considered a safe drug. Therefore, FCM appears as an interesting option to apply high doses of iron as a single infusion in a few minutes in order to obtain the quick replacement of iron stores. The present review on FCM summarizes diverse aspects such as pharmacology characteristics and analyzes trials on the efficacy/safety of FCM versus oral iron and different iv iron compounds in multiple clinical scenarios. Additionally, the information on cost effectiveness and data on change in quality of life are also discussed.